Cutaneous fungal infections affect more than one-fourth of world's population. The pathogenesis and severity of fungal infection depend on various immunological and nonimmunological factors. The rampant use of antifungal therapy in immunocompromised individuals marked the onset of antifungal drug resistance. Fungal resistance can be microbiological or clinical. Microbiological resistance depends on various fungal factors which have established due to genetic alteration in the fungi. 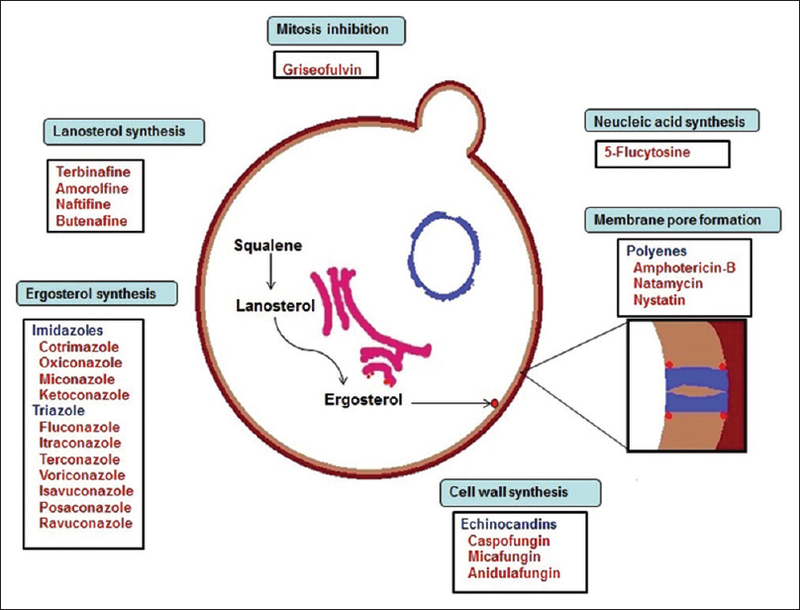 Clinical resistance is due to host- or drug-related factors. All these factors may cause fungal resistance individually or in tandem. In addition to standardized susceptibility testing and appropriate drug dosing, one of the ways to avoid resistance is the use of combinational antifungal therapy. Combination therapy also offers advantages in increased synergistic action with enhanced spectrum activity. Newer insights into mechanisms of drug resistance will help in the development of appropriate antifungal therapy. Background: Although female androgenetic alopecia (FAGA) occurs in genetically susceptible women, some trace elements may play an important role. Aim of the Study: This study aimed to evaluate serum and hair zinc and iron levels in patients with FAGA and to compare the findings with normal controls. 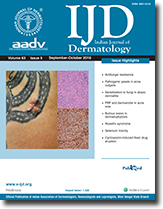 Patients and Methods: A case–control study that was conducted at Dermatology Clinic in Basra General Hospital, Basra, Iraq. The participants were divided into two groups: The first group consisted of 27 women with FAGA and the second was age-matched 28 healthy women control group. The serum and hair zinc and iron assays were done for all participants. Results: Both hair and serum zinc levels in FAGA group were significantly lower than that in the control (103.4±25.5 ppm vs. 143.5±33.1 ppm for hair and 65.6±14.2 μg/dl vs. 128.4±41.4 μg/dl for serum). Hair iron level in FAGA was significantly lower than in control (17.9±3.8 ppm vs. 26.9±7.4 ppm, P>0.05). Serum iron level in FAGA group was lower than in the control, but it was not significant statistically (88.9±22.3 μg/dl vs. 100.9±18.9 μg/dl). 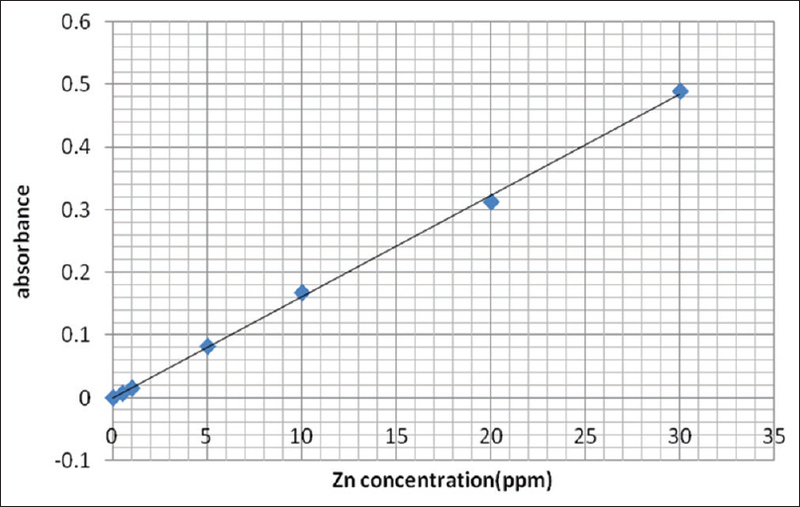 Except for the hair iron, there was no significant correlation between zinc and iron concentrations in hair and serum with severity of alopecia. Conclusions: Zinc and iron levels in serum and hair were lower in FAGA compared to that of normal individuals indicating that trace elements might play an important role in the etiopathogenesis of FAGA. Background: Awareness against abuse of topical corticosteroids (TC), especially over the face, has been going on for last 5 years in India. In spite of that we are getting lots of cases in our hospitals. Aims: The aims of this study were to ascertain the demographics, magnitude and clinical features of TC misuse on the face among the dermatology outpatient department (OPD) attendees and to analyze its causes. Methods: This study was conducted in a tertiary care medical center of eastern India. Patients with relevant facial dermatoses were asked about their current use of topical formulations and confirmed to be TSDF were included in the study. Results: A total of 748 patients with facial dermatoses were screened, of which 271 (36.22%) were using TC. Of them mostly young adults between 20 and 29 years (37.10%) were using TC. Average duration between starting of use of medication and the onset of symptoms was 5 months. Ninety-eight (36.16%) patients were using topical corticosteroid for the treatment of acne and 74 (27.30%) were using as depigmenting cream. About 108 (39.85%) patients bought medicine over the counter being recommended by pharmacist/shop owner. Rosacea like features with photosensitivity was the most common adverse effect found in 79 (29.15%) patients whereas comedonal acne/acne exacerbation were found in 68 (25.09%) patients. Most of them (227, 83.76%) were unaware about the side effects of steroids. Conclusions: TC misuse in patients with facial dermatoses is still quite common even after efforts to grow the awareness among population. Background: Recent studies have shown that human beta-defensin-1 (hBD-1) and (human beta-defensin-2 hBD-2), which are antimicrobial peptides produced by the skin, play a role in the pathogenesis of acne vulgaris (AV). Objective: The aim of this study was to determine the role of antimicrobial peptides in the pathogenesis of AV and enlighten the effects of doxycycline and isotretinoin in the expression of these defensins in AV. Materials and Methods: A total of 44 patients (22 patients in each group) with Grade 6 and 8 AV who were indicated doxycycline or isotretinoin for their treatment, and 20 healthy volunteers were included in this study. Pretreatment cutaneous samples were obtained from pustular lesions and uninvolved skin of AV patients and were repeated after the treatment. Only one biopsy was obtained from controls. Results: Cutaneous levels of hBD-1 and hBD-2 were significantly increased in AV patients when compared with healthy controls (P<0.05). Doxycycline therapy achieved a decrease in hBD-1 levels (P<0.05), whereas isotretinoin therapy achieved a reduction in hBD-2 levels when compared with pretreatment levels (P<0.05). Posttreatment hBD-1 and hBD-2 levels were not different between doxycycline and isotretinoin groups (P>0.05). Conclusion: In the light of these results, it was reasonable to assume the role of hBD-1 and hBD-2 in the pathogenesis of AV. Our results showing a significant reduction in hBD-1 staining with doxycycline treatment and in hBD-2 with isotretinoin suggested that some part of their anti-acne effect worked through these mechanisms. Context: Acne vulgaris is a disorder showing persistent inflammation in the pilosebaceous follicles. It is one of the most prevalent dermatoses that millions of people suffer from globally. Aim: The aim of this study was to identify Candida species from patients with acne and to determine their drugs susceptibility. Subjects and Methods: A total of 70 cutaneous samples from acne vulgaris patients suspected to have Candida infections were collected. Macroscopic and microscopic morphology were recorded followed by polymerase chain reaction-sequencing of ITS regions, using universal primers. In vitro antifungal susceptibility was performed using Clinical and Laboratory Standards Institute method. Results: Overall, 11 Candida species including Candida parapsilosis 8 (72.73%), Candida krusei 1 (12.5%), Candida lusitaniae 1 (12.5%), Candida kefyr 1 (12.5%), and a Trichosporon asahi out of the collected clinical materials were isolated and identified. C. parapsilosis isolates susceptibility to diverse concentrations of the antifungal agents to isolate Cp1 study indicated that the isolated Cp8 and Cp5 with minimal inhibitory concentration (MIC) 50 = 32, 0.5, 0.25 and MIC 90 of <64, <1, <0.5 μg/ml fluconazole, itraconazole, and ketoconazole were resistant, respectively. Some of the isolates having relative strength, almost all other species of C. parapsilosis isolates were susceptible to these drugs. Conclusion: C. parapsilosis was the most prevalent Candida species in acne vulgaris samples which had higher in vitro susceptibility for antifungals. Background: Fungi as a source of allergen are still largely neglected in basic research as well as in clinical practice. This study aimed to highlight the impact of fungal allergens in a group of patients suffering from atopic dermatitis (AD). Aims and Objectives: The evaluation of the sensitization to fungi in AD patients aged 14 year and older and the evaluation of the relation of fungal sensitization to the occurrence of other atopic diseases and parameters. Materials and Methods: All patients satisfying inclusion criteria attending our hospital between 2008 and 2017 were included in the study. The complete dermatological and allergological examinations were performed in all included patients including examination of specific immunoglobulin E, skin prick test to mixture of fungi and inhalant allergens, evaluation of asthma bronchiale, rhinitis, onset of AD, family history about atopy, duration of eczematous lesions, severity of AD. Pairs of these categories were entered in the contingency tables and the Chi-square test for relationship of these variables was performed with the level of significance set below 5%. Results: Three hundred and thirty-one patients were included in the study; the average age was 26.8 years. The sensitization to fungi was recorded in 100 patients (30%). In these patients, the occurrence of asthma bronchiale, rhinitis, family history about atopy, sensitization to grass and trees was significantly higher than in patients without sensitization to fungi. We did not find any significant relation between the sensitization to fungi and the severity of AD, no relation was also found between the sensitization to fungi and sensitization to mites, animal dander, bird feather, and dust. Conclusion: The occurrence of asthma bronchiale, rhinitis, family history about atopy, sensitization to grass and trees was significantly higher in AD patients with sensitization to fungi. No relation was found between the severity of AD and the sensitization to fungi. Context: Vitiligo is a psychosocial problem which significantly affects quality of life in Indian scenario. Aims: The purpose of this study was to compare the changes in quality of life in patients of vitiligo before and after treatment with narrowband ultraviolet B (NBUVB) phototherapy. Subjects and Methods: A total of 54 patients had completed the study. The age ranged between 16 and 70 years with a mean age of 26.77±14.2 years. The initial dose of NBUVB was 300 mJ/cm2 in adults and 150 mJ/cm2 in children twice weekly with 20% dose increment on subsequent visits. It was given for a maximum period of 6 months and was followed up for another 6 months to determine stability of repigmentation. Results: The average number of exposure given to the patients was 45.63±12.74 while the mean irradiation cumulative dose was 39.8 J/cm2. Mean Dermatology Life Quality Index (DLQI) of the vitiligo patients was 8.64±4.32 while those patients with acrofacial vitiligo had a mean DLQI of 11.78±5.61. After treatment with NBUVB, mean DLQI of all vitiligo patients was significantly reduced to 5.86±2.15 (P<0.01). Conclusions: This study showed that phototherapy had a positive therapeutic outcome in vitiligo, especially in younger patients. Even a small, depigmented lesion in a child could be psychosocially devastating. 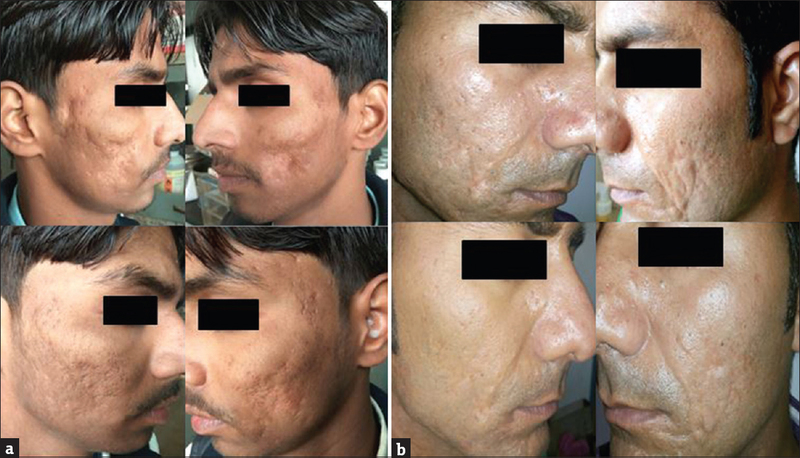 Background: Scarring due to acne is a frequently encountered problem in dermatological outpatient department. Microneedling has been a well-accepted modality for the treatment of atrophic acne scars. Platelet-rich plasma (PRP) is a newer option to investigate. Aims: The aims of this study were (1) to compare the efficacy of combined dermaroller and PRP therapy with dermaroller alone in facial acne scars and (2) to assess the psychosocial impact due to acne scars and its treatment. Methods: A total of 55 patients were included in the study and randomly divided into two groups, Group A: 28 and Group B: 27. Proper counseling was done, and detailed clinical findings were recorded. Patients in Group A were treated with dermaroller alone while Group B patients underwent treatment with a combination of dermaroller and intradermal PRP injections. A total of three sitting were done at monthly interval. Final response was assessed at 1 month after the last sitting. Criteria of evaluation included Goodman and Baron's quantitative scale, visual analog score, and dermatology life quality index scores. Side effects were noted. 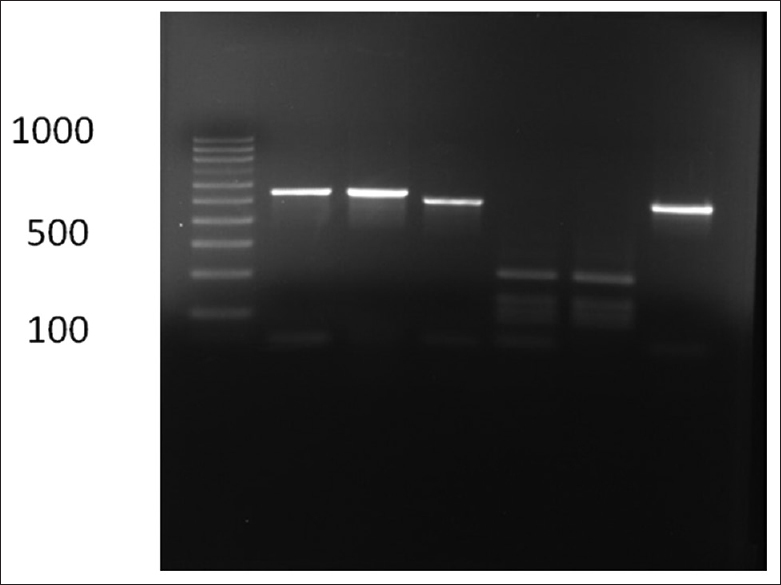 Results were analyzed using Chi-square test and t-test. Results: Significant percentage improvement was noted in both the groups. However, Group B treated with both modalities had better results when compared with that in the Group A. Conclusion: A combination approach using dermaroller and PRP was a safe and better option than using dermaroller alone in atrophic acne scars for clinical improvement as well as for improvement in dermatology life quality index score. Idiopathic eruptive macular pigmentation (IEMP) is an asymptomatic condition with dark brown, nonconfluent lesions chiefly occurring in children and adolescents. The usual sites involved are face, trunk, extremities, and the lesions resolve over few months to years. We report an unusual presentation of this uncommon condition. 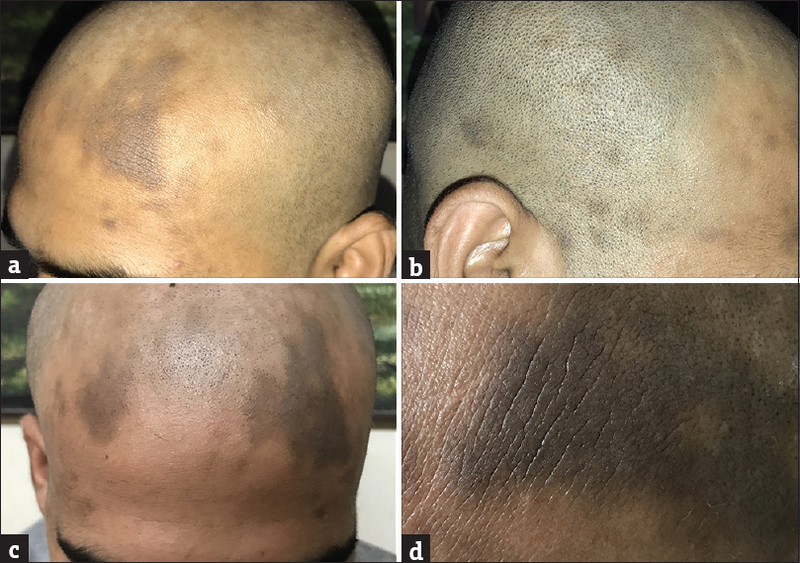 A 22-year-old male presented with multiple dark-colored asymptomatic lesions on the scalp and forehead for the past 3 years. There was no history of preceding symptoms, drug, or applications, past or family history of such lesions. 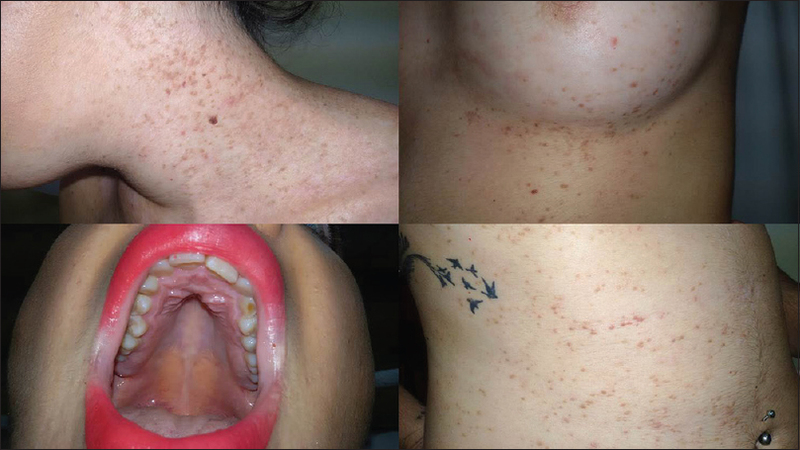 Examination revealed multiple hyperpigmented macules and barely elevated nonscaly plaques with a velvety feel akin to acanthosis nigricans (AN). Dermoscopy was similar to AN. Blood sugar, thyroid, and lipid profiles were normal. 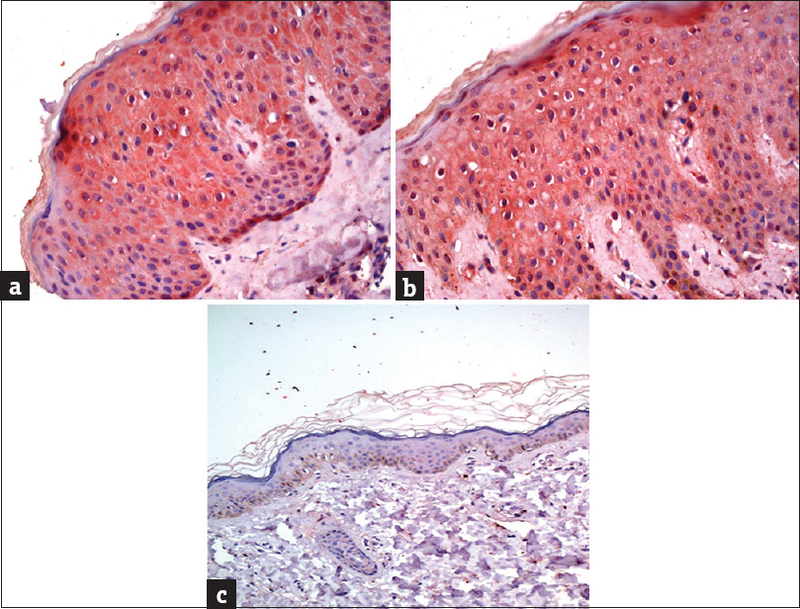 Histology showed “pigmented papillomatosis” concluding the final diagnosis of IEMP. 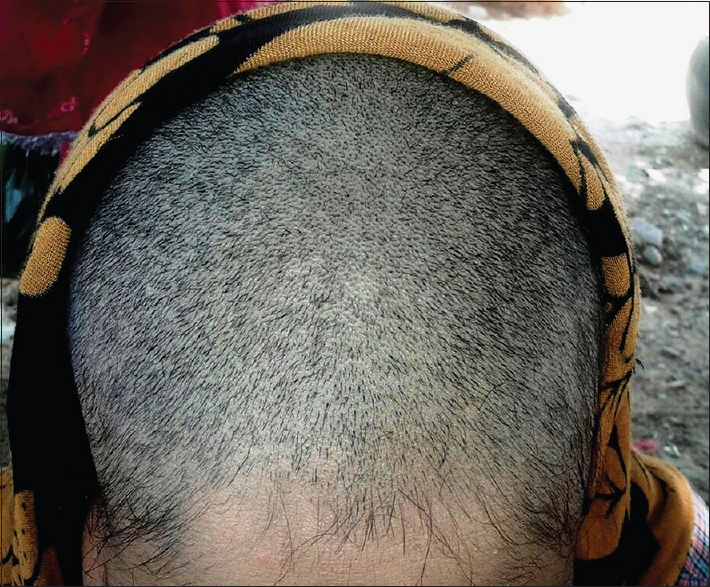 Confluence of lesions is a rarely described phenomenon, with the scalp being a hitherto unreported site. The velvety feel of lesions, the dermoscopic, and histopathological findings further substantiate the hypothesis of this entity being an eruptive variant of AN. Infectious diseases can clinically present as vesiculobullous disorders. 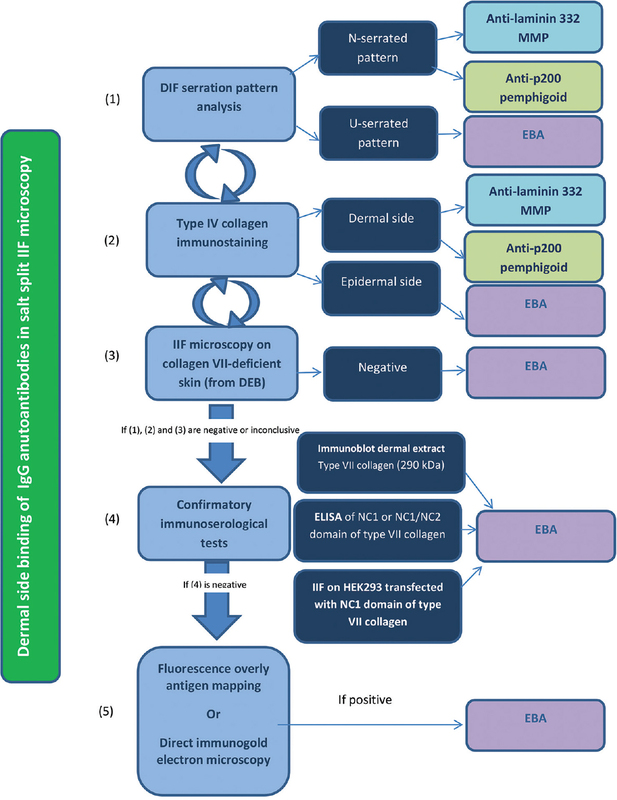 Direct immunofluorescence (DIF) study of skin biopsy helps distinguish true autoimmune blistering disorders from other conditions. In many situations, even DIF findings in infections disorders imitate autoimmune process. 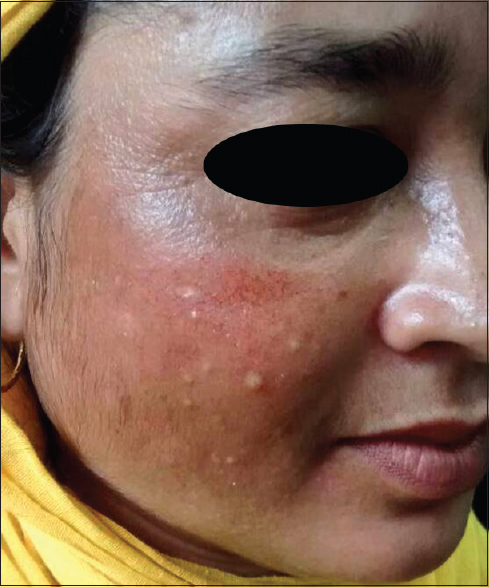 Here, we describe a case of 29-year-old female with extensive dermatophytosis having presentation mimicking bullous pemphigoid both clinically and histopathologically including DIF findings. 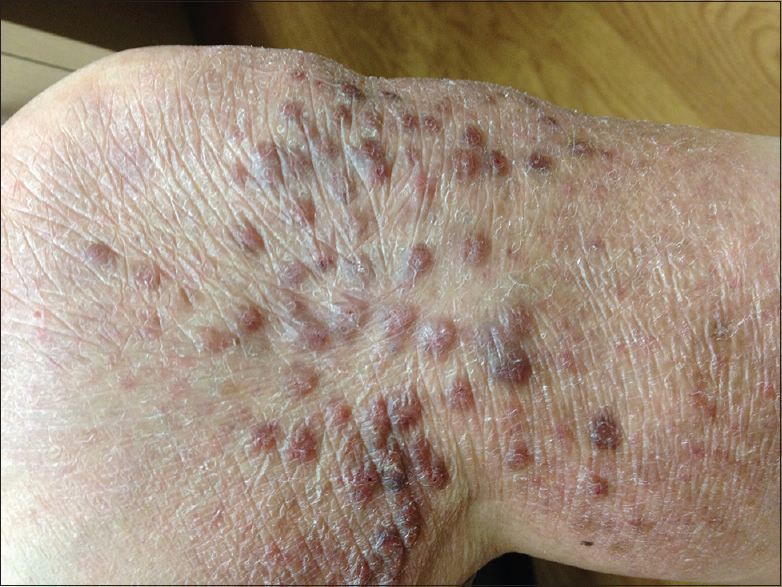 Bullous pemphigoid (BP) is an autoimmune bullous disease commonly seen in adult population but rarely encountered in the pediatric population. Although the exact etiology of BP remains unclear, various vaccines, infectious agents, and drug use have been blamed in the etiology of BP. Here, we present a 14-year-old patient who developed BP after using metamizole and whose diagnosis was clinically and histopathologically confirmed. 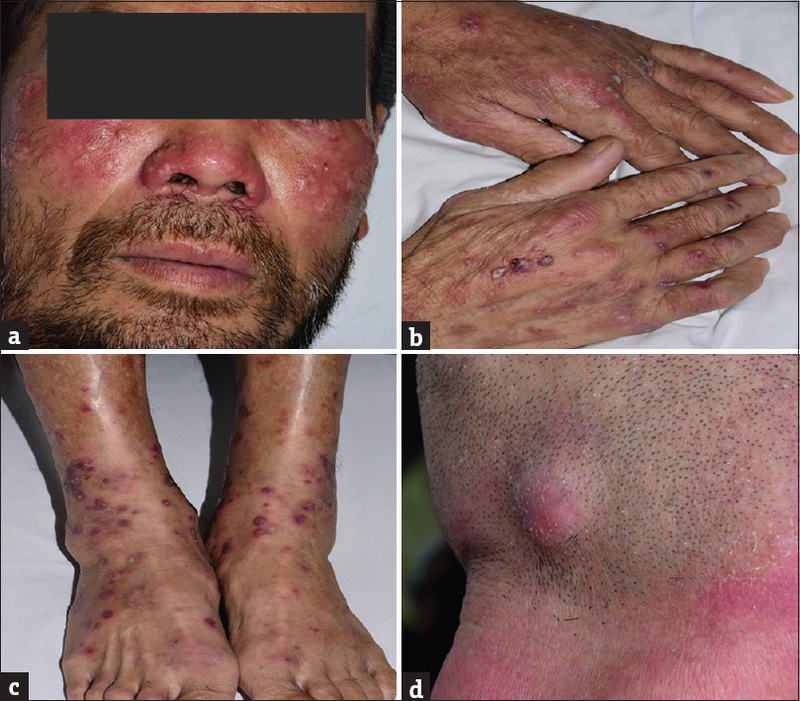 Rowell's syndrome (RS) is recognized since 1963 as a presentation of lupus erythematosus (LE) with erythema multiforme-like lesions and characteristic immunological changes. Antiphospholipid syndrome (APS) encompasses antibodies to phospholipids/phospholipid-binding cofactor proteins and/or circulating lupus anticoagulant with clinical manifestations of thrombosis such as recurrent spontaneous abortions, etc. A 32-year-old female with primary infertility since marriage (7 years) and sequential appearance, for the past 6 months, of various lupus-specific cutaneous lesions, “targetoid” lesions on palms, musculoskeletal, ocular and auditory (sensorineural hearing loss [SNHL]) complaints with positive serological profile for SMD-1, SS-A/Ro, SS-B/La, U1-snRNP, Ku, antiphospholipid and anticardiolipin antibodies, and histopathologically confirmed LE is presented as a case of concurrent overlap syndrome, RS and APS, primary infertility, and SNHL. A brief review of RS including analysis of data of cases reported from India hereto vis-a-vis that of cases worldwide up to 2012 has also been done. 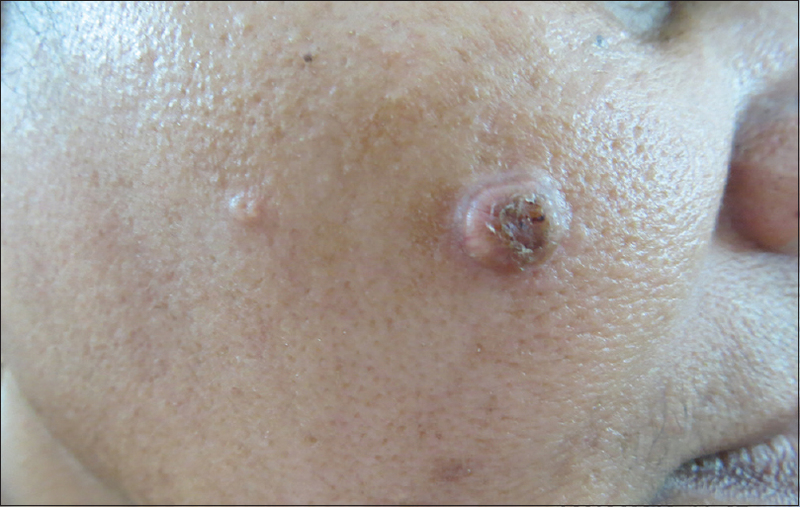 Cutaneous metastasis (CM) from internal malignancies is commonly seen. 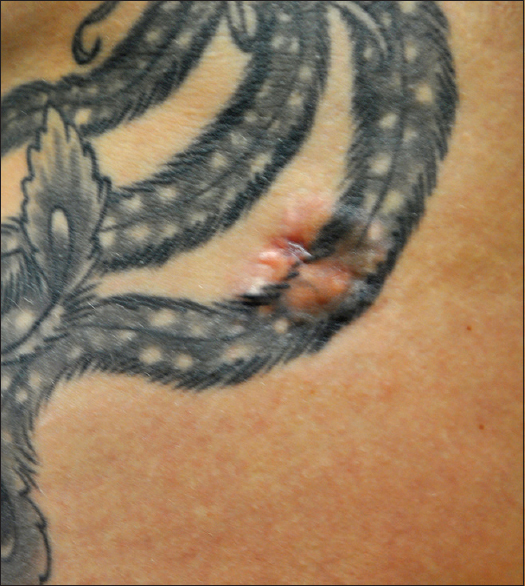 Sometimes, skin metastases can be the first sign of advanced cancer or an indicator of cancer recurrence. 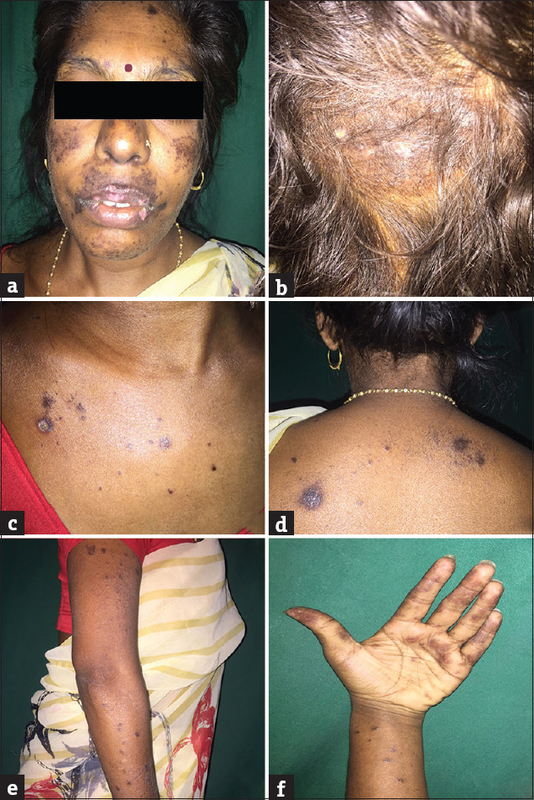 Cases of breast cancer with cutaneous progression after or during trastuzumab therapy have been described in the past, frequently associated with systemic disease progression. However, CM during adjuvant trastuzumab therapy is very rare. It has been hypothesized that cancer cells located in the skin survive and take proliferative advantage by virtue of an immune-tolerance mechanism that hampers trastuzumab-mediated antibody-dependent cell-mediated cytotoxicity. We describe a case of human epidermal growth factor receptor-2-overexpressing breast cancer presenting with diffuse CM during adjuvant trastuzumab therapy.